With the New Year comes the resolutions. When the clock struck midnight on January 1st, 2015 many people turned the page on 2014 and made a promise to do an act of self-improvement. Often times it’s eating healthier or going to the gym more regularly. With the New Year, I thought I could put a spin on a typical New Year’s Resolution and make it about AWS. How could you improve on your AWS environment? Without getting too overzealous, let’s focus on the fundamental AWS network infrastructure, specifically an AWS Virtual Private Cloud (VPC). An AWS VPC is a logically isolated, user controlled, piece of the AWS Cloud where you can launch and use other AWS resources. You can think of it as your own slice of AWS network infrastructure that you can fully customize and tailor to your needs. So let’s talk about VPCs and how you can improve on yours. Make sure you’re using VPCs! The simple act of implementing a VPC can put you way ahead of the game. VPCs provide a ton of customization options from defining your own VPC size via IP addressing; to controlling subnets, route tables, and gateways for controlling network flow between your resources; to even defining fine-grained security using security groups and network ACLs. With VPCs you can control things that simply can’t be done when using EC2-Classic. Are you using multiple Availability Zones (AZs)? An AZ is a distinct isolated location engineered to be inaccessible from failures of other AZs. Make sure you take advantage of using multiple AZs with your VPC. Often time instances are just launched into a VPC with no rhyme or reason. It is great practice to use the low-latency nature and engineered isolation of AZs to facilitate high availability or disaster recovery scenarios. Are you using VPC security groups? “Of course I am.” Are you using network ACLs? “I know they are available, but I don’t use them.” Are you using AWS Identity and Access Management (IAM) to secure access to your VPCs? “Huh, what’s an IAM? !” Don’t fret, most environments don’t take advantage of all the tools available for securing a VPC, however now is the time reevaluate your VPC and see if you can or even should use these security options. Security groups are ingress and egress firewall rules you place on individual AWS resources in your VPC and one of the fundamental building blocks of an environment. Now may be a good time to audit the security groups to make sure you’re using the principle of least privilege, or not allowing any access or rules that are not absolutely needed. Network ACLs work at the subnet level and may be useful in some cases. In larger environments IAM may be a good idea if you want more control of how resources interact with your VPC. In any case there is never a bad time to reevaluate security of your environment, particularly your VPC. Bring your VPC home. AWS, being a public cloud provider, allows you to create VPCs that are isolated from everything, including your on-premise LAN or datacenter. Because of this isolation all network activity between the user and their VPC happens over the internet. One of the great things about VPCs are the many types of connectivity options they provide. Now is the time to reevelautate how you use VPCs in conjunction with your local LAN environment. Maybe it is time to setup a VPN and turn your environment into a hybrid cloud and physical environment allowing all communication to pass over a private network. You can even take it one step further by incorporating AWS Direct Connect, a service that allows you to establish private connectivity between AWS and your datacenter, office, or colocation environment. This can help reduce your network costs, increase bandwidth throughput, and provide a more consistent overall network experience. 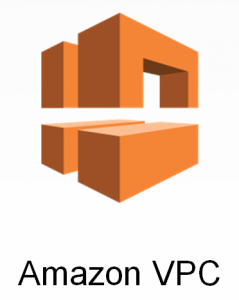 These are just a few things you can do when reevaluating your AWS VPC for the New Year. By following these guidelines you can gain efficiencies in your environment you didn’t have before and can rest assured your environment is in the best shape possible for all your new AWS goals of 2015. 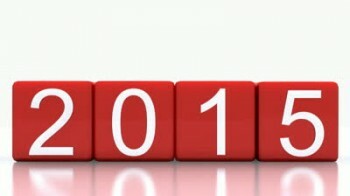 With every new year comes a new beginning. The holidays give us a chance to reflect on our achievements from the previous year, as well as give us a benchmark for what we want to accomplish in the following year. For most individuals, weight loss, quitting a bad habit, or even saving money top the list for resolutions. For companies, the goals are a little bit more straight forward and quantitative. 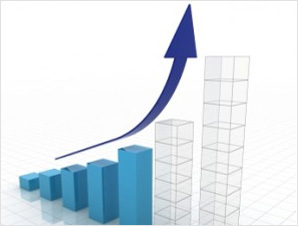 Revenue goals are set, quotas are established, and business objectives are defined. The success of a company is entrenched in these goals and will determine; positively or negatively, how a company should be valued. Today’s businesses are becoming even more complex than ever, and we can thank new technologies, emerging markets, and the ease of globalization for helping drive these new trends. One of the most impactful and fast adopting technologies that is helping businesses in 2015 is the public cloud. What’s amazing, though, is that how businesses are planning for the adoption of public cloud is still unknown to most. Common questions such as “Is my team staffed accordingly to handle this technology change?” or “How do I know if I’m architecting correctly for my business?” are coming up often. These questions are extremely common with new technologies, but it doesn’t have to be difficult if you take these simple steps. Plan Ahead: Guide your leadership to see that now is the time to review the current technology inventory being utilized by the company and strategically outline what it will take to help the company become more agile, cost effective, and leverage the most robust technologies in the New Year. Over communicate: By talking with all the necessary parties, you will turn an unknown topic into water cooler conversation. Involve as many people as possible and ask for feedback constantly. This way, if there is anyone that is not on-board with this technology shift, you will have advocates across the organization helping your cause. Track your progress: Keep an active log of your adoption process, pitfalls, to-dos, and active contributors. Establish a weekly cadence to review past success and upcoming agendas. Focus on small wins, and after a while you will see amazing results for your achievements. Handle problems with positivity: Technology changes are never easy for an organization, but take each problem as an opportunity to learn. If something isn’t working, it’s probably for good reason. Review what went wrong, learn from the mistakes, and make sure they don’t repeat themselves. Each problem should be welcomed, addressed and reviewed accordingly. Stay diligent: Rome wasn’t built in a day, and neither will your new public-cloud datacenter be. Review your plan, do constant check points against your cloud strategy, follow your roadmap and address problems as soon as they come up. By staying focused and tenacious you will be successful in your endeavors. Happy 2015, and let’s make it a great year. Public cloud is growing. Private cloud is not. Big Data and Internet of Things is hot. Virtualization is not. 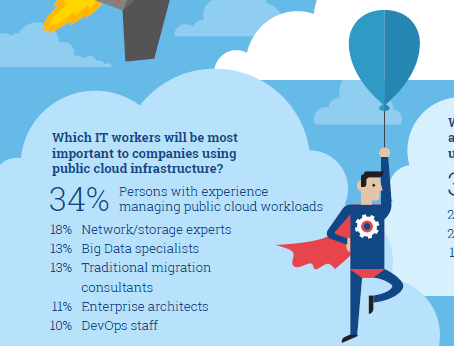 These are just a few of the findings of the 2nd Watch enterprise cloud trends survey, just released. More than 400 IT managers and executives from large companies participated, and 64% of them said that they will spend at least 15% more in 2015 on public cloud infrastructure. All signs point to the fact that the public cloud is continuing to grow. Q3 earnings statements from both Amazon and Microsoft for their respective cloud services, AWS and Azure, were robust. Companies are going to need some help though. As always, IT skills are at a premium. In our own conversations with customers, supported by the survey, CIOs and CTOs are looking for bright engineers who know how to manage and optimize workloads in the cloud. As well, the ability to natively design applications for the public cloud will be a critical competitive advantage in the coming year. The opportunity is there for any company – regardless of your size or industry. Large consumer goods are innovating with mobile apps that require not just savvy developers, but an IT organization that can leverage public cloud services to mash-up data and deliver cool new services that drive brand loyalty. The trick is that each provider, such as AWS, operates differently. CIOs need specialists, and when they’re hard to find, using third-party experts can reduce risks and deliver faster ROI. 2nd Watch has years of diversified experience across many different project types, regimented training and continued learning programs for their employees that can supplement your IT staff. A parallel challenge is that few large companies are ready to migrate their entire data center to the cloud just yet. With legacy applications and customer requirements, large companies typically still require or desire some systems to be hosted on their own data centers. Thus, cloud providers and technologies that are able to integrate data centers will see ample demand next year. 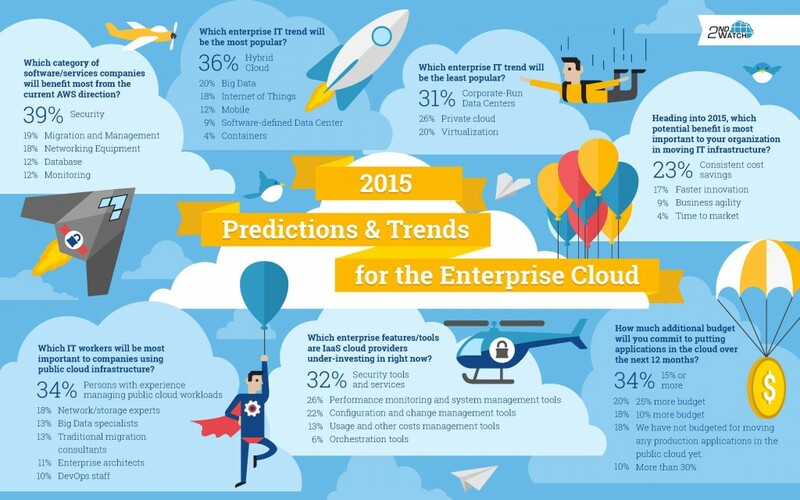 Hybrid cloud terminology will still be popular with enterprise IT in 2015, according to our survey. However, this is not an end state but a state of transition in maintaining physical data centers while they migrate to public cloud. The recent news that the AWS OpsWorks application management service (based on Chef) is now available for managing public cloud and on-premise servers is one sign of the growing flexibility that CIOs will have in managing workloads across their environments. Companies want to see more industrial-strength management tools that can bridge internal data centers and public cloud data centers and deliver a unified picture of the entire infrastructure. IT executives are also looking for more help on the security front. The major public cloud providers are already investing heavily in this area, particularly AWS, but startups will play a significant role in bringing new endpoint security solutions to market in 2015. 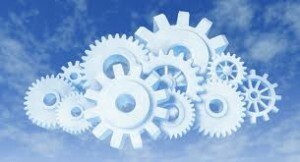 Survey participants said that security tools and services is the most underinvested category by cloud technology firms. I believe they will say differently in a year’s time. Software companies also have opportunities in modern IT management, with many companies demanding more automated options for performance monitoring, system management and change management in the cloud. If you are interested in learning more about the best-in-class cloud management tools that are available today, schedule your free 2nd Watch Workshop now*. *Applies to Enterprise Customers new to 2nd Watch with a specific use case to build the workshop around. Download the full Infographic for more trends to watch for in 2015. Read more on Enterprise Cloud Trends for 2015 in 2nd Watch CTO, Kris Bliesner’s, article in Data Center Knowledge – Planning for the Future: Enterprise Cloud Trends in 2015. Momentum continues to build for companies who are migrating their workloads to the cloud, across all industries, even highly regulated industries such as Financial Services, Health Care, and Government. And it’s not just for small companies and startups. Most of the largest companies in the world – we’re talking Fortune 500 here – are adopting rapid and aggressive strategies for migrating and managing their workloads in the cloud. While the benefits of migrating workloads to the cloud are seemingly obvious (cost savings, of course), the “hidden” benefits exist in the fact that the cloud allows businesses to be more nimble, enabling business users with faster, more powerful, and more scalable business capabilities than they’ve ever had before. So what do enterprises care about when managing workloads in the cloud? More importantly, what should you care about? Let’s assume, for the sake of argument, that your workloads are already in the cloud – that you’ve adopted a sound methodology for migrating your workloads to the cloud. Raise your expectations I would submit that enterprises should raise their expectations from “standard” workload management. Why? Because the cloud provides a more flexible, powerful, and scalable paradigm than the typical application-running-in-a-data-center-on-a-bunch-of-servers model. Once your workloads are in the cloud, the basic requirements for managing them are not dissimilar to what you’d expect today for managing workloads on-premise or in a data center. Service Levels: Basic service levels are still just that – basic service levels – Availability, response time, capacity, support, monitoring, etc. So what’s different in the cloud world? You should pay particular attention to ensuring your personal data is protected in your hosted cloud service. Support: Like any hosting capability, support is very important to consider. Does your provider provide online, call center, dedicated, and/or a combo platter of all of these? Compliance: You should ensure your cloud provider is in compliance with the standards for your specific industry. Privacy, security and quality are principal compliance areas to evaluate and ensure are being provided. Be Proactive: It used to be that enterprises only cared if their data center providers/data center guys were just good at being “reactive” (responding to tickets, monitoring apps and servers, escalating issues, etc). But now the cloud allows us to be proactive. How can you optimize your infrastructure so you actually use less, rather than more? Wouldn’t it be great if your IT operations guy came to you and said “Hey, we can decrease our footprint and lessen our spend,” rather than the other way around? Partner with the business: Now that your workloads are running in the cloud, your IT ops team can focus more on working with the business/applications teams to understand better how the infrastructure can work for them, again rather than the other way around, and they can educate the business/applications teams on how some of the newest cloud services, like elasticity, big data, unstructured data, auto-scaling, etc., can cause the business to think differently and innovate faster. Enterprises should – and are – raising their expectations as they relate to managing their workloads in the cloud. Why? Because the cloud provides a more flexible, powerful, and scalable paradigm than the typical hardware-centric, data center-focused approach. Implementing Cloud Infrastructure in the Enterprise is not easy. An organization needs to think about scale, integration, security, compliance, results, reliability and many other factors. The pace of change pushes us to stay on top of these topics to help our organization realize the many benefits of Cloud Infrastructure. Think about this in terms of running a race. The race has not changed – there are still hurdles to be cleared – hurdles before the race in practice and hurdles on the track during prime time. We bucket these hurdles into two classes: pre-adoption and operational. Pre-adoption hurdles come in the form of all things required to make Cloud Infrastructure a standard in your enterprise. A big hurdle we often see is a clear roadmap and strategy around Cloud. What applications will be moving and when? When will new applications be built on the Cloud? What can we move without refactoring? Another common hurdle is standards. How do you ensure your enterprise can order the same thing over and over blessed by Enterprise Architecture, Security and your lawyers. Let’s examine these two major pre-adoption hurdles. Having a clear IT strategy around Cloud Computing is key to getting effective enterprise adoption. Everyone from the CIO to the System Admin should be able to tell you how your organization will be consuming Cloud and what their role in the journey will be. In our experience at 2nd Watch, this typically involves a specific effort to analyze your current application portfolio for benefits and compatibility in the Cloud. We often help our customers define a classification matrix of applications and workloads that can move to the Cloud and categorize them into classes of applications based on the effort and benefits received from moving workloads to the Cloud. Whether you have a “Cloud First,” “Cloud Only” or another strategy for leveraging Cloud, the important thing is that your organization understands the strategy and is empowered to make the changes required to move forward. Standardization is a challenge when it comes to implementing Cloud Computing. There are plenty of Cloud Service Providers, and there are no common standards for implementations. The good news is that AWS is quickly becoming the de facto standard for Cloud Infrastructure, and other providers are starting to follow suit. 2nd Watch works closely with our customers to define standards we call “Reference Architectures” to enable consistency in Cloud usage across business units, regions, etc. Our approach is powered by Cloud Formation and made real by Cloud Trails, enabling us to deploy standard infrastructure and be notified when someone makes a change to the standard in production (or Test/Dev, etc.). This is where the power of AWS really shines. Imagine… A service catalog of all the different application or technology stacks that you need to deploy in your enterprise – now think about having an automated way to deploy those standards quickly and easily in minutes instead of days/weeks/months. Standards will pay dividends in helping your organization consume Cloud and maintain existing compliance and security requirements. Operational hurdles for Cloud Computing come about due to the different types of people, processes and technology. Do the people who support your IT infrastructure understand the new technology involved in managing Cloud infrastructure? Do you have the right operational processes in place to deal with incidents involving Cloud infrastructure? Do you have the right technology to help you manage your cloud infrastructure at enterprise scale? How does my IT organization have to change when I move to the cloud? What new IT roles are going to be required as I move to the cloud? What type of training should be scheduled and who should attend? Who will manage the applications after they are moved to the cloud? People are critical to the IT equation, and the Cloud requires IT skills and expertise. It has been our experience that organizations that take the people component seriously have a much more effective and efficient Cloud experience than those who might address it after the fact or with less purpose. Focus on your people – make sure they have the training and support they need to ensure success once you are live in the Cloud. Cloud infrastructure uses some of the same technology your enterprise deploys today – virtualization, hypervisors, hardware, network, etc. The difference is that the experts are managing the core components and letting you build on top. This is a different approach to infrastructure and requires enterprise IT shops to consider what changes will need to be made to their process to ensure they can operationalize Cloud computing. An example: How will your process deal with host management issues like needing to reboot a group of servers if the incident originates from a provider instead of your own equipment? 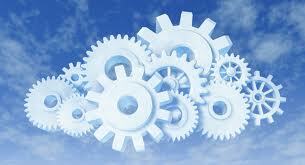 Finally, technology plays a big role in ensuring a successful Cloud infrastructure implementation. As users request new features and IT responds with new technology, thought needs to be given to how the enterprise will manage that technology. How will your existing management and monitoring tools connect to your Cloud infrastructure? To what pieces of the datacenter will you be unable to attach? When will you have to use Cloud Service Provider plugins vs. your existing toolset? What can you manage with your existing tools? How do you take advantage of the new infrastructure, including batch scheduling, auto-scaling, reference architectures, etc.? Picking the right management tools and technology will go a long way to providing some of the real benefits of Cloud Infrastructure. At 2nd Watch we believe that Enterprise Architecture (in a broad sense) is relevant regardless of the underlying technology platform. It is true that moving from on premises infrastructure to Cloud enables us to reduce the number of things demanding our focus – Amazon Web Services vs. Cisco, Juniper, F5, IBM, HP, Dell, EMC, NetApp, etc. This is the simplicity of it – the number of vendors and platforms to deal with as an IT person is shrinking, and thank goodness! But, we still need to think about how to best leverage the technology at hand. Cloud adoption will have hurdles. The great news is that together we can train ourselves to clear them and move our businesses forward.